You may be familiar with or have heard about Yorkshire Pudding, even Yorkshire Terriers but did you know Yorkshire has a TEA? It is immensely fitting that Harrogate a small town in Yorkshire, North England should have a tea named after it. You should now be wondering why that may be so, and of course I will tell you. 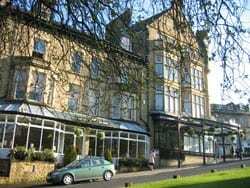 First, Harrogate is known for the quality of its water. Good water is of course the main ingredient in a good cuppa tea! Harrogate is home to many ancient wells, the most famous being Tewit Well discovered by Sir William Slingsby during the 1700’s. Slingsby believed the water had powerful healing properties, able to cure just about anything. The wells became an attraction and visitors flocked to ‘take the waters’ at Harrogate, turning the small town into a Spa destination. This in turn created a proliferation of tea shops, the most famous being Betty’s. To this day a visit to the town is not complete without stopping at Betty’s for tea and some exceedingly good cakes. Tea served in Harrogate certainly has a delicious taste. Second, and the most fitting reason Harrogate has a tea named after it is because this is my home town! This is where my love of tea and my tea journey first began. My mum could ‘sup some tea’ as they say in Yorkshire and as a family we did plenty of tea drinking. There was not a single occasion that did not call for a cuppa and all visitors to our home were welcomed with a good cup of tea and some homemade cake or biscuits. I learned my tea making skills at an early age and my passion for tea has never wavered in fact continues to grow. My life is very different now, but each new day starts with a cup of Harrogate tea, taking me back to those times in the Yorkshire town. Thanks mum. This is certainly a special tea from a special town. Be sure to share Harrogate, Yorkshire tea with all your visitors. At Local Coffee + Tea, our Harrogate Yorkshire Tea is a blend of Orange pekoe and Broken Orange pekoe tea from 3 growing regions in China, Kenya and India. The style of this tea is blended to make a good strong brew with some astringency. You may like to steep your tea for 3 minutes or much longer. Of course I drink the traditional Yorkshire way with milk. I also use some agave nectar but it tastes great without. What a great way to start your day, refreshed and full of Yorkshire energy.